All I did was ask who wanted to watch a science movie and I had 3 little people jumping up and down on the couch begging to get started. When it’s a movie, it just sounds more fun. So, we put in our DVD and had a family movie night-watching a science DVD. That was a first! 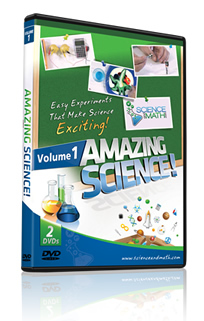 We received Volume 1 of Amazing Science from Scienceandmath.com. 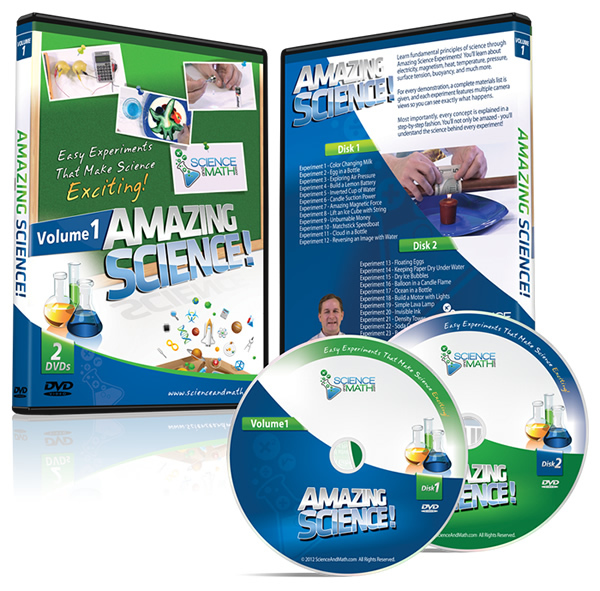 This is a 2 DVD set which contains videos of multiple experiments being performed. The materials needed for each experiment are shown and an explanation follows each experiment. A few examples of the experiments included are color changing milk, dry ice bubbles, unburnable money, and invisible ink. This set retails for $19.95 but can be downloaded instantly for $17.99. What we liked: The kids were thrilled to be able to watch a DVD for science. I was thrilled to watch the experiments being done without actually having to do them. No messes here! The experiments are shown being performed in close up so that the kids could really tell what was happening. The clarity of the DVD is great, enabling the kids to see each detail. The explanation following each experiment was very detailed and my hubby and I enjoyed hearing how and why the experiments worked. Because we have kids with food allergies, many of these experiments could not be performed safely in our house. So our favorite part of the DVD was being able to watch experiments that we could not ever complete-especially ones like color changing milk or putting an egg in a bottle. It was a no-stress way to get in some science and witness experiments. This is food allergy friendly science. We we didn’t like: What’s not to like? The explanations were a little lengthy for our young crew but would be excellent for middle elementary and older. My husband and I enjoyed hearing the explanations even though the kids were ready to move on to watching a new experiment. Overall: The DVD’s are a great quality with sharp images of the experiments. They are simple and straightforward, allowing the student to focus on the experiment being performed. The experiments are shown close-up and from different angles so that you can clearly see the results. The explanations are detailed and clear. This is science that doesn’t destroy my house or make my kitchen messy, and these are experiments that work-there’s no guesswork for me involved. The kids enjoyed these videos and experiments and I know they will only benefit more from them (especially the explanation part) as they get older. We used these videos with our kids (ages 6, 4, and 3) and they were able to understand much of the information. However, I think the videos are best suited for mid-elementary to middle school students with even high school students enjoying the experiments as well. We plan to keep these and watch them over the next few years to add to our science studies. Check out how the other Crew members enjoyed their science DVD’s at the blog!